This is an Ottoman Turkish style name. Ibrahim Edhem is the given name, the title is Pasha, and there is no family name. 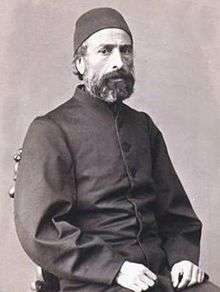 Photograph of Ibrahim Edhem Pasha by Abdullah Frères, circa 1890. Ibrahim Edhem Pasha (1819–1893) was an Ottoman statesman of Greek birth who held the office of Grand Vizier in the beginning of Abdulhamid II's reign between 5 February 1877 and 11 January 1878. He served numerous administrative positions in the Ottoman Empire including minister of foreign affairs in 1856, then ambassador to Berlin in 1876, and to Vienna from 1879 to 1882. He also served as Army Engineer and minister of interior from 1883 to 1885. 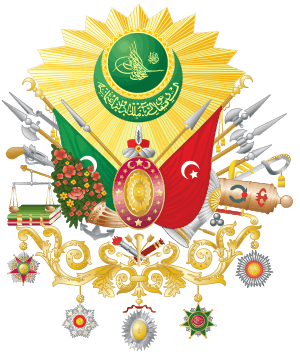 In 1876-1877, he represented the Ottoman Government at the Constantinople Conference. He was born in Chios of Greek ancestry, in a Christian Greek Orthodox village on the island of Chios. Strangely, his connection to Chios is not well-documented: his son Osman Hamdi Bey claimed that he was a member of the Skaramanga family, but Edhem Pasha himself tried to efface his Greek connections. As a young boy in 1822, he was orphaned and captured by Ottoman soldiers during the massacre of the Greek population of Chios. He was sold into slavery, brought to Constantinople, and adopted by the (later) grand vizier Hüsrev Pasha. Lacking his own children and family, Hüsrev Pasha raised about ten children who had been orphaned or bought as slaves, many of whom ascended to important positions. The child, now named İbrahim Edhem, quickly distinguished himself with his intelligence and after having attended schools in the Ottoman Empire, he was dispatched along with a number of his peers, and under the supervision of his father, then grand vizier, and of the sultan Mahmud II himself, to Paris to pursue his studies under state scholarship. There he returned a Bachelor of Arts, and was one of the top pupils at the École des Mines. He was a classmate and a friend of Louis Pasteur. He thus became Turkey's first mining engineer in the modern sense, and he started his career in this field. Ibrahim Edhem Pasha was the father of Osman Hamdi Bey, a well-known archaeologist and painter, as well the founder of the Istanbul Archaeology Museum and of the Istanbul Academy of Fine Arts. Another son, Halil Edhem Eldem took up the archaeology museum after Osman Hamdi Bey's death and has been a deputy for ten years under the newly founded Turkish Republic. Yet another son, İsmail Galib Bey, is considered as the founder of numismatics as a scientific discipline in Turkey. Later generations of the family also produced illustrious names. The architect Sedat Hakkı Eldem, a cousin, is one of the pillars of the search for modern architectural styles adopted by the Republic of Turkey (called the Republican style in the Turkish context) in its early years and which marks many important buildings dating from the period of the 1920s and the 1930s. A great-grandson, Burak Eldem, is a writer while another, Edhem Eldem, is a renowned historian. 1 2 3 Latimer, Elizabeth Wormeley (2008). Russia and Turkey in the Nineteenth Century. BiblioBazaar. p. 204. ISBN 0-559-52708-X. Grand vizier Edhem Pasha…the grand vizier, who sent him to Paris, whence he returned a Bachelor of Arts, and one of the best pupils at the Ecole des Mines. 1 2 3 Shaw, Wendy M. K. (2003). Possessors and possessed: museums, archaeology, and the visualization of history in the late Ottoman Empire. University of California Press. pp. 97–98. ISBN 0-520-23335-2. Ibrahim Edhem. After studying metals engineering in Paris and Vienna Ibrahim Edhem returned to the Ottoman Empire, where he served in several official posts…He served as ambassador to Berlin in 1876 and to Vienna between 1879 and 1882. ↑ Shaw, Wendy M. K. Possessors and possessed: museums, archaeology, and the visualization of history in the late Ottoman Empire. University of California Press. p. 2003. ISBN 0-520-23335-2. (Osman Hamdi)…His father, Ibrahim Edhem, was born in the Greek Orthodox village of Sakiz. After being captured as a prisoner of war during a village revolt, he was sold as a slave to the chief naval officer, Kaptan-I Derya Husrev Pasha, the head of the Ottoman Navy, who would also soon serve as vizier to the sultan. Chisholm, Hugh, ed. (1911). "Edhem Pasha". Encyclopædia Britannica (11th ed.). Cambridge University Press.